only the background needs stitched on this one. Copyright Painted Pony Designs. For most of us, our stash gets overwhelming. Even though I stitch tons of stuff and regularly cull my stash, I still feel as if it overwhelms. Just over the weekend when I was looking for a UFO, I found four other projects I had forgotten about completely. And if illness or other disaster strikes and you can no longer stitch, the problem is even more urgent. Lately it’s been on my mind. Last Saturday my ANG chapter had a stash sale of the threads and canvases given to another needlework group in our area. They didn’t know what to do with the needlepoint so they called me. Next Saturday I’ll be going to a guild auction. My friend who is in that chapter said they have hundreds of items and tons of thread. I can hardly wait! I really hope at this I’ll find: finishing supplies, books I don’t have, and favorite threads no longer made. Of course I will buy canvases as well, I always do. In fact the angel at the top of this article is something I got at the last auction; it just needed a background. I also get asked about what to do with stash often. Over the next few days we’ll talk about what to do with them. Stitched needlepoint, even when it is finished into an item, can have little value. If you look at prices for these on eBay, they are very low. If you think your finished piece has value, you need to get it appraised. Both EGA and ANG certify appraisers. You will need to either contact them or do Internet searches to get appraisals. Friends and family may want stitched pieces for their own collections. I would always go to them first. In that stash I was dealing with there were several projects partially stitched or completely kitted. I think they came from a shop series. If you belong to a guild chapter sets like this might make good additions as a lot at an ANG or other auction. Stitch them up and get them finished. Contact ANG for donations to their auction. But don’t stop there. Often locals charities, arts organizations, hospitals, and schools will have benefit auctions. One organization near me used to have a Christmas Tree Auction. Others might not have a theme. Beautiful hand-made items can be great for these events. It can also give you a tax deduction. I don’t know if our local guilds are unusual in this, but we all have or used to auctions to fund our educational activities. We work together so they don’t overlap. Members who pass away donate stash, shops that have gone out of business donate stash, folks cleaning out donate stash. members who can no longer stitch donate stash. An auction committee gathers the items and prices everything and decides what’s fixed price, what’s silent auction and what’s live auction. Some chapters collect all the time, others only at specific times. The auction is at the usual meeting place and is free to attend. My chapter has underwritten activities since the mid-nineties with our fund. 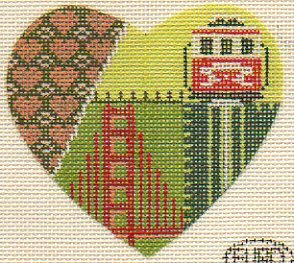 The SF heart is a vintage canvas I have wanted for years I got at ou guild’s auction. It’s so much fun and a great place to dispose of our add to your stash. Janet, I have a friend, Pat, who is a great stitcher. When my mother was alive, and suffering from Alzheimer’s and living in a group home, Pat asked if the home could use any pictures. I asked the owner and her reply was, “Yes, those types of pictures me more to the residents than framed art work. They see the work and tell stories or talk about the subject.” Pat took and had them framed, took them to the home and all the women there said they were there children or they had stitched them, for some they became more active which with Alzheimer’s doesn’t happen very often. For family members visiting them it’s a joy to see light in their eyes when they see pretty stitched pieces. Another way to clean up your stash, brighten a patients day with a stitched piece. I’m sure we all know of someone who has a relative suffering from a major disease who would like something nice to look at. Ask around and get a warm fuzzy feeling that you brightened someone’s day.